The Center for Excellence in Learning and Teaching is offering two professional development programs specifically designed to enhance teaching effectiveness and improve student learning. The newly created Teaching and Learning Academy and the Teaching Partners Program are open to newer faculty with teaching responsibilities (tenured, tenure-eligible, term, staff with teaching appointment). ISU Extension and Outreach has launched a new website for the Iowa Rural Equity Project featuring a series of video interviews with equity managers and experts from a dozen Iowa-based venture capital funds and angel investor networks interested in rural ventures. Congratulations to Donna Otto, secretary to the department chair, who will complete 40 years of service at Iowa State University on April 9! Donna says, "I've seen a lot of changes in the last 40 years, but nothing like what's coming with Workday." Holly Cook, ag bus senior, was one of 10 college students nationwide to receive a $2,500 scholarship from the National Pork Producers Council at their annual meeting in Orlando March 7. Chad Hart, associate professor, was interviewed for a March 20, 2019, Ohio's Country Journal story, "Farms on the Margins." Wendong Zhang, assistant professor, and John Lawrence, vice president for Extension and Outreach, spoke about ag trade with China to about 300 people at the Mason City Ag Breakfast, as reported by the Globe Gazette, March 20, 2019. David Swenson, associate scientist, was interviewed by Lexie Troutman, Ames Tribune, for a March 15 story, "Turning malls into main streets." 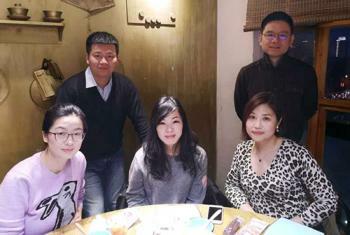 Several department alums met for a get-together in a restaurant near Tsinghua University while all were in Beijing recently. Jing came from Zhejiang province to Beijing to give a talk and Jingbo came from Hubei province to Beijing to attend a conference. Wendong Zhang, assistant professor, was interviewed for a story in the March 14, 2019 Ames Tribune, "Land Trends and Values Survey shows decrease in cropland prices in Iowa." The paper, "Consequences of the Clean Water Act and the Demand for Water Quality," by David Keiser, assistant professor, and Joseph Shapiro, University of California Berkeley, was cited in the Plains Gazette March 13, 2019. Chad Hart, associate professor, was interviewed for the story "No breakthroughs, but Iowa farmers hear end to tariffs is near," in the March 13 Lake Mills Graphic. Leigh Tesfatsion, research professor, had a paper published in a recent issue of the journal Applied Energy. Sergio Lence, professor, has been honored for having 25 continuous years of service to Iowa State University and is now a member of ISU's 25 Year Club. The club was informally founded in 1915 when members of the staff who had served for at least 25 years were honored at a convocation. 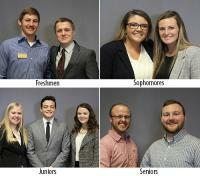 Ten members of the Iowa State Ag Business Club were awarded club scholarships at the 2019 Ag Bus Club awards banquet March 2, 2019. 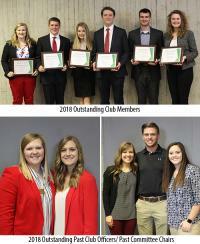 The Agricultural Business Club presented members with Outstanding Club Member Awards at their annual awards banquet March 2, 2019. Ebby Luvaga, senior lecturer, was a featured speaker at the Foreign Agricultural Service Junior Professional Advisory Committee (FAS JPAC) & Women in Agriculture Event at the USDA in Washington D.C. March 1, 2019. Seemingly every week, university faculty comes under fire for statements or material presented in the classroom. Join University Counsel, Michael Norton, for a review of the current environment, and its implications for freedom of speech, and academic freedom. Ag Bus senior Brandon Hanson has been named a recipient of the 2019 Wallace E. Barron All-University Senior Award by the ISU Alumni Association. The Iowa Falls native is majoring in agricultural business, economics and international agriculture. Chad Hart, associate professor, was interviewed for a Feb. 28 story in Iowa Farmer Today for the story, "Farmers look for good news on new trade destinations." 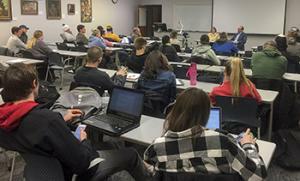 The Iowa State Econ Club held its monthly meeting in 368A Heady Hall Feb. 27. The banking round table discussion included guest speakers, Jim Plagge, president and CEO of Bank Iowa, and Mary Howell, president and CEO of Maxwell State Bank. John Russell, market president at Bankers Trust Company was slated to speak, but was unable to attend. A report by Wendong Zhang, assistant professor, was quoted in a March 2, 2019, editorial in the Omaha World-Herald called "Understand these long-term factors shaping China's demand for ag imports."